The author advocates for this growing form of spiritual nurture among Friends, and gives good guidelines for seeking and sustaining a spiritual friendship. Trish Roberts is an Australian Friend who felt increasingly called to deepen her own spirituality in ways that will also deepen the faith life of others. To that end, she has engaged in continued study and practice of spiritual nurture. After two terms at Pendle Hill in 1995 as a resident student, Trish initially shared her enthusiasm about spiritual friendships with her meeting, Canberra Regional Meeting of Australia Yearly Meeting. In December 1997 in meeting for worship, it was “as if God nudged me in the side and said, ‘Don’t wait until you’ve done your other chores. Go to the computer every day and write for an hour and a half.” After the initial writing, Trish was able to complete the manuscript while working at Pendle Hill as summer staff during 1998 and 1999. 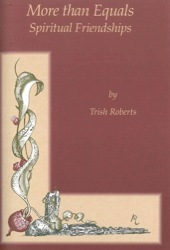 The pamphlet was illustrated by Paul Roberts, Trish’s former spouse, who works as a teacher and artist in Australia.